As children, Young-Gwang meets Jane at her birthday party. His father works as a chauffer to Jane's father. At Jane's birthday party, by chance, Young-Gwang bumps into a boy named In-Woo. In-Woo's father is the vice president of a trading company that Jane's father runs. In-Woo looks down on Young Gwang. Meanwhile, at the company, Jane's father Yoon Il-Goo (Ahn Nae-Sang) receives an unexpected visit from his friend District Attorney Oh (No Kyung-Joo). D.A. Oh mentions that his trading company is under investigation because of slush funds. Yoon Il-Goo begins to suspect his friend, company vice president Seo Jae-Myung (Son Chang-Min). On the way to Jane's birthday party, Yong Il-Goo tells Seo Jae-Myung to go to the district attorney's office. Seo Jae-Myung refuses and reaches for the car door handle. While they are struggling, the car becomes involved in an accident and falls over into a nearby body of water. The car is completely submerge in water and Seo Jae-Myug grabs a body and swims to land. Once he makes it out of the water he realizes that the man he pulled out of the car was the chauffer Kim In-Bae (Lee Gi-Yeong) and not company president Yoon-Il Goo. At Jane's birthday party, a baseball game is organized. Young-Gwang never played baseball before, but because of In-Woo's cocky behavior takes part in the game. During the game Young-Gwang hits a home run. He then signs his name on the baseball and gives it to Jane. He also asks her to marry him one day. At this time Jane's mother receives a phone call from the hospital. Jane's mother takes Jane and drives off to the hospital. Because of heavy rains, Jane's mother gets into a car accident. Rescuers found Jane's mom unconcsious, but couldn't find Jane. Jane was thrown out of the car and loses her memory in the process. At the hospital, vice president Seo Jae-Myung is questioned by the district attorney. At this time the chauffeur lies and says the cause of the accident was heavy rain. Vice president Seo Jae-Myung then hears the news of the car accident involving Jane and her mother. The police then calls vice president Seo Jae-Myung and informs him that a girl matching the description of Jane was found, but she has no memory of who she is. Seo Jae-Myung instructs the chauffeur to go pick up Jane and take her to a place where nobody will know. He promises that he does this, he will help to open a restaurant and take care of his children for life. Because of the accident Jane can't remember even her own name, but she does find a baseball with the words "Young-Gwang's first home run" on it in her bag. Soon after, vice president Seo Jae-Myung takes the position of company president. The chauffer takes Jane to a distant orphanage and drops her off. Out of guilt, the chauffer tells her that her name is Jane and don't forget her name. Years later, Young-Gwang and In-Woo both become professional baseball players. In-Woo is the cleanup hitter for a major league team, while Young-Gwang is demoted to the minor leagues due to his poort hitting. The coach of the minor league team warns Young-Gwang that he has only 2 months to raise his batting average above .200 or he will be kicked off the team. One day, Young-Gwang and In-Woo are injured in different games and brought to the same hospital at almost the same time. In-Woo recieves all the attention, while Young-Gwang is largely ignored. Suddenly, a nurse's aide comes up to Young-Gwang and tells him that she has been his fan since he was a high school player, because of his name Young-Gwang. Takes over the KBS2 Wed. & Thu. 21:55 time slot previously occupied by "The Princess' Man" and followed by "Wild Romance" on January 4, 2012.
kishsleigh Oct 15 2013 4:42 am Actually...for me..jae-in end up with yeong gwang..she already answered yeong gwang YES when they were kids..plus..her last wish is to experience true love and wants to marry the one whom she met when they were kids. As you observed jae in smiles at the end...it means YES...she will definitely marry him. blossom Sep 03 2013 7:57 pm I love this dorama very much. interesting and inspiring! Amy Jul 14 2013 4:31 pm I expected a lot from this drama What did I get a 24-long episode drama that in many parts boring. And the end....FORGETTABLE! Unpredictable plots have unpredictable outcome! = IN U May 24 2013 1:16 pm Its too obvious, simply too obvious, that the intention of the maker is to leave an open ending and leave it for the viewers to pick their ending! And I know exactly why! 1. The obvious, readable ending that ENDS Glory Jane then and there! at episode 24! - the Chun Myung end! - for obvious reasons of this obvious character, everything in his obvious life has been laid out. Character wise and intentions wise towards Jane, he has dutifully ticked off his checklist of pre requisites before marriage! He even claimed on air he would like to marry Jane! In my opinion, he has nothing left to spill on air that would make his intentions more known! He WANTS Jane, but does how much? Very much. The question is, is his love for Jane as true as it gets, and how much? That, in itself, is very questionable, people. And I feel, that if it would end with this ending, then it would indeed BE an ENDING that has no beginning! This is an ongoing STORY of LOVE and its journey, I don't think it should end so fast with such a seemingly forced, methodical way as Chun Myung did! And also, I don't feel that Jane loves him in that way! For some time now she cared for him just like she would to her brother, which she even admitted to once! The lack of disliking him for anything, other than feeling drawn or attracted To Caring for him just strengthens this more! She likes him! She doesn't love him! The bestest PROOF of this is just the way she reacted to his marriage proposal! Who in their right mind, most even, someone who SHOULD BE in love, would LAUGH AND GIGGLE BEFORE A MARRIAGE PROPOSAL? not even a blush, or a tear on her cheek. its like acting before a friend. its like chun myung was SAYING A JOKE! just one among many reasons why she should NOT even take him seriously in that way, because she cant! 2. The CONTINUING, unreadable ending - In yoo ending - for not so obvious hints even before, showed conflict and yet no resolution between this two! enough said! there is obvious CHEMISTRY between this two that Jane appears to hesitate to confront! The question is WHY. Why are you avoiding him Jane? And why THAT reaction towards his intimacy? One can only wonder why. To me it seems that she is trying not to admit something to herself that she feels towards him that only he seems to affirm on his personal level: his confession of love=SINCERE, his actions showing his love=SINCERE, his fight for his love for her=SINCERE, his care for what she cares for shows=SINCERITY, his right to love her shows=SINCERITY. That's right people, SINCERITY. IT SHOWS. IT REVERBERATES FROM HIM. I CAN SEE IT. I cant see it from Chun AT ALL. LEE HAS IT. CHUN DOES NOT. He doesn't even have one speck of right to declare marriage then and there, justbecause he hit homerun, because there's no love there for him. I believe Jane's got this one high and he doesn't even know it! That's my verdict. It's Lee Jang Woo who continues this tale! And the one who is included in the parts not shown to the public! and there you go! ps. sorry for the rant. this show has really gotten me carried away! it must be justified! ps2 to the losers, accept defeat and try try try .... again! Leigh May 06 2013 2:18 am Who will be Jane's husband?please tell me. cherry Oct 31 2012 8:47 am Done watching all episodes of Glory Jane.. I love the story, It's awesome and very touching and the cast were great too.. I'm starting to like Chun Jung Myung and Park Min Young.. They really have a good chemistry.. Hope I could watch another korean drama Like this..
Maggie Sep 14 2012 7:40 am Thanks for giving me headache. That's it? leea Jun 15 2012 9:20 am for some reason, sometimes I feel bored when I watch it. perhaps, because the plot is too predictable. maybe? Edwin Obando May 12 2012 1:29 pm Since my country Costa Rica, I want to congratulate all the cast and the staff that mame this dorama possible. My wife and I really really like it a lot. That is why I liked the ambiguous endings in some dramas. It allows the viewer to decide the ending and there is no wrong answer. My ending, Yoon Jane would not pick either one of the guys in order to pursue her career in nursing which was her objective in the first place. If she choose one of the guys in the future I think it would most likely be In U once they got their careers stabilized. I don't think Young Gwang would wait that long for her. One of my favorite actors in this drama outside the leads was Kim Sung Oh. He was so great as the germaphobe, Dae Sung. I think he doesn't get credit on how good of an actor he is. He really seems to really get into his characters and makes each of them different. I would like to see him as a lead in a romantic comedy. I think he would be great teamed up with Lee Yeon Hee. Love the ending of this most beautiful drama because it leaves a question. Jae In's true love is actually In U because he can give up his father and the luxurious life style for Jae In. So can we watch another 24 to 30 episodes to see a happy ending Jae In with In U .
I feel Drama shows her real love is In U َand In U's love is deep and real but the battle of rich/poor didn't let Director to show real decision َand this is disadvantage of some of Korean film. when something is correct and right so it is no difference who do or say poor or rich. I see many Korean drama and I really like them. This the best and most beautiful modern day drama of year 2011. The story is creative, interesting and unique with some emotional scenes. Although Min Park is not my favorite actress but she really deserved credits for this awesome drama. She played her part with outstanding performance. I believed she put in tremendous effort into it. It's so much better than her previous drama like City Hunter. The character I really like is Jang Lee (In U) because he is sincere and honest and tried his best to protect Min Park (Jae In). He knows he is going to get hit by his father but he so persistence in protecting and loving Jae In with all his heart. Can't get enough of this most beautiful drama. Would like to see a part II or continuation of this wonderful drama. Thumbs up for this drama. Would like to see Min Park and Jang Lee in another beautiful drama in 2012. Consus Feb 04 2012 2:57 am Who was the actor who played the loan shark thug at the beginning and then was part of the competing team of four? He was never credited in the page even though he played a significant role in the show. By the way show was cute. With the did she or didn't she ending. jb Jan 31 2012 12:59 pm isn't the girl at the end with IN WOO, Jae in's mom? WTF? loyalfan_1 Jan 20 2012 4:59 am Honestly, this drama is little too short. PMY, when you come back for your next projected drama it should be more than 50 episodes. Before we knew it, the most beautiful drama has ended. Keep up the good work. Emy Jan 20 2012 12:55 am Super sweet& great drama but too little episode!! !the film can have many part after this come on it doesn't even look like its end infact it looks like its just began!plz continue it! !didn't like the finishing at all!!! !hope i'll see part 2 soon. loyalfan_1 Jan 17 2012 8:08 pm Love the ending of this most beautiful drama because it leaves a question. Jae In's true love is actually In U because he can give up his father and the luxurious life style for Jae In. So can we watch another 24 to 30 episodes to see a happy ending Jae In with In U . Just like the Baker's King drama, Yoo Jin choose the other guy instead of Tak Gu. loyalfan_1 Jan 16 2012 6:48 am This the best and most beautiful modern day drama of year 2011. The story is creative, interesting and unique with some emotioanl scenes. Although Min Park is not my favorite actress but she really deserved credits for this awesome drama. She played her part with outstanding performance. I believed she put in tremendous effort into it. It' so much better than her previous drama like City Hunter. The character I really like is Jang Lee (In U) because he is sincere and honest and tried his best to protect Min Park (Jae In). He knows he he is going to get hit by his father but he so persistence in protecting and loving Jae In with all his heart. Too bad Jae In did not choose him. Can't get enough of this most beautiful drama. Would like to see a part II or continuation of this wonderful drama. Thumbs up for this drama. Would like to see Min Park and Jang Lee in another beautiful drama in 2012. 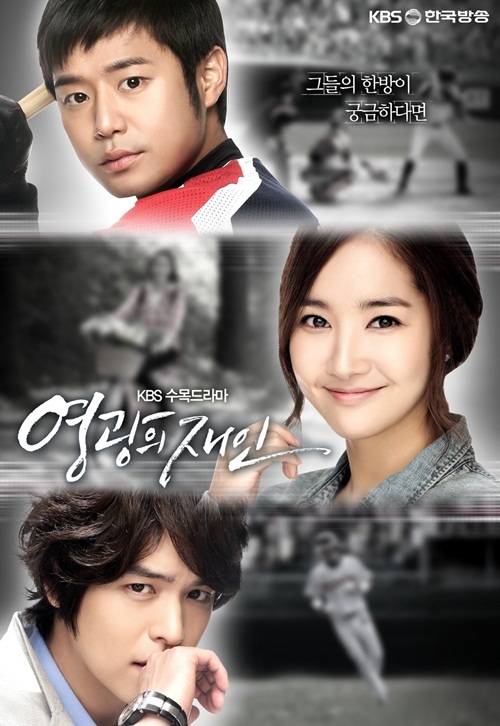 Min young love Jan 11 2012 6:11 am Glory jane is a great drama so far.,always support park min young n her drama's. ;-)..can't get enough with her smile..:-).n lee jang woo.,i really like him in gj(dislike him in smile donghae)he so handsome..:$.in malaysia gj just reach 21st ep.i'm hoping a great ending. Elisa Maurice Jan 09 2012 11:09 am Everytime I watch this, I cant wait for the next episode. Really addictive cause its very fast-paced unlike other dramas. Love it!! loyalfan_1 Jan 04 2012 5:32 am Jin Lee, she did an excellent job in this drama. She should get an award too. She is so beautiful. Sandeep Dec 16 2011 7:04 pm Love this drama!!! Love all the actors especially the lead actress. She is cute & very pretty! dont call me yaya! Dec 15 2011 10:08 am omg! I just love this drama. Lots of suspense in it. I think, i've fallen i love with Jung Myung. I just looovvveee him in this drama. How come I discover him late? I am now on episode 14. I hope that Jane will end up together with Yeongwanng <3! Lol. Pray that I can catch up with this drama before my semester break ends! Go Jane!! lengskee Dec 02 2011 10:20 pm still hooked on Glory Jane!!! love the 10th epi where Young Gwang loosened up and sang his heart out! And when Jane left him in the karaoke, very funny! Sabrina123korea Nov 30 2011 4:32 am YESTERDAY'S MAMA 2011 IS ROCK!!! afifahazaidil Nov 27 2011 8:39 pm I love watch this!!! Anywayi love yoon jane!!! PMY Nov 15 2011 5:54 am I still like Chun Jung-Myung be partner with MGY... Park Min Young ???? P...... S...... Girl !!!! Mae Nov 12 2011 3:54 pm woahhhhhhhhhhhhhhhhhhhhhhhhhhhhhhhhhhhhhhhhhhhhh!!!!!!!!!! I L O V E T H I S DRAMA!!!!!!!!!!! BEST DRAMA EVERRR!!!!!!!!! !! I LOVE THE TWO MALE ACTORS AND I LOVE PARKMIN YOUNG TOO!!!!! OMG OMG IM SO ADDICTED TO THIS DRAMA!!!!!!!!!!!!!! lengskee Nov 09 2011 11:08 pm just watched episodes 3 & 4 this week and I really like the story. I loved it when Yung-Gwang was shocked upon learning that Yun Jane is his sister lol! He wrote in the letter that he wanted to see her(possibly a girlfriend). All the actors are performing very well, so far. The lead actors are beautiful to look at=) I think the ratings will go up as the series continues. Its just the beginning yet you feel that you have been watching it for weeks! june Oct 30 2011 12:28 am Please let it be Chun Jung-Myung and Park Min Young in the end!! Riisa Oct 25 2011 7:49 pm This drama is so far so good! I NEVER cry in dramas unless they're worth tearing up for and it's been awhile since a drama has gotten me tearing up and this drama got me. The only likable drama from Park Min Young was Sungkungkwan Scandal. I did NOT like City Hunter and Park Min Young's character in City Hunter because that drama was so dreadful, I didn't even finish watching it. But this drama is bringing Park Min Young back up on my list now. Good luck! SPOILER: The only thing I don't like is the usual drama thing where the "rich/high class kid" ends up poor because she-lost-her-parents-thing (and gonna find out she's from a rich/high class family later on). I usually feel more EMOTION when it's ACTUALLY a "poor/underclass kid" who finds out later about his real identity. SunSoo Oct 24 2011 8:21 am love this drama..! full of surprises...^_^ Park Min Young is so great for playing her role, it seems like it was the real her in real life. renny Oct 14 2011 7:41 am This show is great!! The first 2 episodes def hook you in! joey-imo Sep 30 2011 7:47 am and some baseball actions, please! Samantha Aug 14 2011 2:40 pm More kisses please.